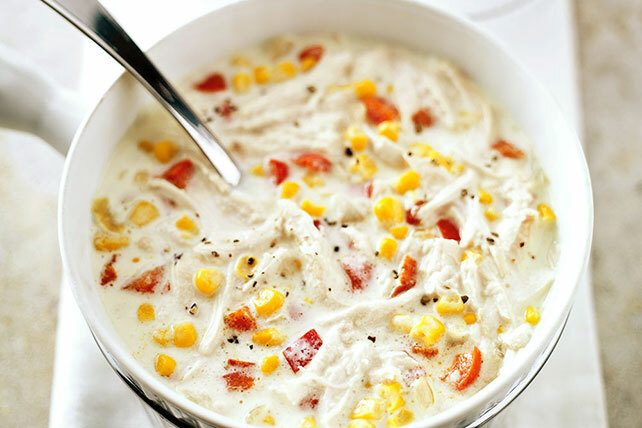 Delight in this creamy turkey soup that includes cream-style corn. Ready to serve in just 25 minutes, Creamy Turkey Soup with Corn is an easy-to-make dish that is full of flavor. It's great for any leftover turkey you have around! Add cream cheese; cook on low heat 3 to 4 min. or until melted, stirring constantly. Stir in turkey, corn, broth and milk. For more robust flavor, roast and peel the red peppers before chopping. Add to soup along with the turkey. Or, use drained, jarred roasted red peppers instead. This delicious soup can be made ahead of time. Cool, then refrigerate up to 2 days. Reheat before serving. This is a great way to use leftover cooked turkey.